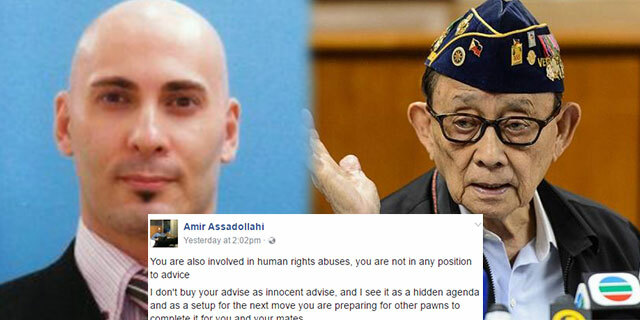 Canadian Political Scientist Amir Assadollahi chided former Philippine president Fidel V. Ramos for criticizing President Rodrigo Duterte’s handling of the attacts in Marawi City. Former President Fidel V Ramos also Opposed the declaration of Martial Law in the whole island of Mindanao. Amir said Ramos are not in any position to advise about human rights violations despite of the facricated image he created. You talk about violation of human rights, and that is all nice and cozy words to say while those TERRORISTS hold hostage the people, chop off their heads, murder them, threaten and terrorize the public and burn property and bomb in public to kill the innocent to force their demands met. If they were human, they would not do such things, and so they have violate the human rights of others. Yes, if they were captured alive, you have to abide by rules of combat that we value and part of that is respecting human rights even though they act violently and do not follow the rules of combat and do not value the human rights the way we value. If you remain soft on them, they will spread their diseased mentality all over the Philippines and all over Southeast Asia, and the Philippines and the Southeast Asia will become the new breeding ground for all kinds of terror groups and international criminal syndicates. Mr. Ramos, you cannot and must not divide the country over this issue by bringing up the so much internationally debated issue of the so called "Human Rights" that the opposition party to the government reforms fabricated and has been continuously led the foriegn media and international organizations' attack on the Philippines. Those fabrications were made due to lack of tacts by people like you who need to be truly investigated for violations of human rights during the Marcos Presidency era as well as after the exile of him by creating a fake revolution sponsored and orchestrated by corrupted oligarchs and foriegn contra affairs agencies and agents abroad and in the Philippines. Your message is sound and your advise is good on taking strong measures without violating human rights, but at the same time you are setting up ground for foriegn invasion, revolts and protests just as you and your friends did it during the Marcos time. You act as if you are part of the government, but you have a track record of it that when the real push comes to shove, you change sides, quit or disappear, and later appear on the other side. I don't buy your advise as innocent advise, and I see it as a hidden agenda and as a setup for the next move you are preparing for other pawns to complete it for you and your mates. You have support the fight against terrorism 100% and not be so vague on what you mean by strong measures and human rights. Get your acts straight and make sure you are with the people and not with your own self-diluted and self-deluded notion of righteousness and protector of human rights. You of all people are the last person who can talk on such topic as "Human Rights" as you have been a direct link to the abuses during the Martial Law as you have been one of the key executives then even though you acted as if you did not know anything. You must also be one of the key players in the assassination that took place that gave birth to corruption that followed by Marcos' exile. I am sure things will come to clear sooner than later about your hand in human rights violations and plotting in overthrowing the Marcos government, and selling the Philippines to foriegn powers. I might not be a Filipino, but I can see your moves clear enough to say that you are not in any position to advise about human rights violations despite of the fabricated image you have created.